Thomas Dunne Books, 9781250076038, 288pp. 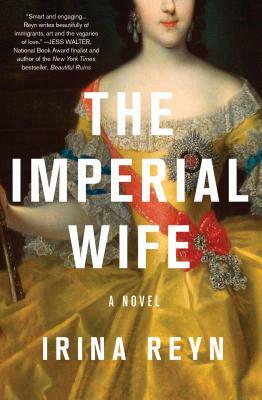 "The Imperial Wife is a smart, engaging novel that parallels two fascinating worlds and two singular women. Irina Reyn writes beautifully of immigrants, art and the vagaries of love." As questions arise over the provenance of the Order and auction fever kicks in, Reyn takes us into the dazzling world of Catherine the Great, the infamous 18th-century empress, who may have owned the priceless artifact, and who, it turns out, faced many of the same issues Tanya wrestles with in her own life. Suspenseful and beautifully written, The Imperial Wife asks whether we view female ambition any differently today than we did in the past. Can a contemporary marriage withstand an “Imperial Wife”? "Reyn's mesmerizing new novel['s]...dual storylines are each intriguing, while the novel skips easily between past and present, leaving readers with more knowledge about Russia (imperial and presentday), visual art, auction houses and the lives of the very rich. But its greatest accomplishment is making the inner lives of two fascinating women known...As a fast-paced novel, it's a great read, but as a meditation on what it means to be woman, it's transcendent." "Reyn cleverly weaves Tanya's story around that of young Catherine's [Catherine the Great]. Both suffer because they possesscertain qualities—ambition, decisiveness, sangfroid—that society expects from powerful men but finds suspicious in women." "Two boss women living in very different time periodsin history—modern-day New York City and 18th-century Russia—are connected through the ages by their shared obsession with a priceless piece of royal bling." "Irina Reyn's smart novel...seamlessly flits between the 20 yearsof Catherine, sometimes in a cold, friendless castle and Tanya, sometimes in acold, loveless city. Both women are stronger and smarter than they realize andboth are married to men who are anvils, not anchors."